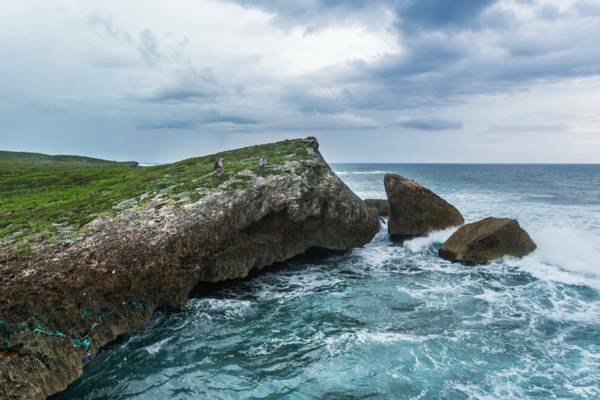 The cliffs and beaches of Norbellis Coves, Middle Caicos. If you enjoy hiking and exploring, Norbellis Coves is a great to spend a few hours. To get here you’ll definitely want shoes suitable for hiking over rocks. Flotsam on the beach at Norbellis Coves, Middle Caicos. An adventure in itself to get to, this stretch of rugged and wild coastline is an amazing place to explore. 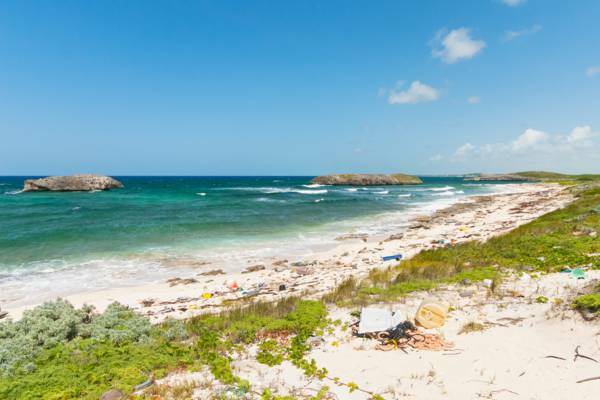 Found to the west of Mudjin Harbour Beach, Norbellis Coves offers small beaches, limestone ocean cliffs, tiny ironshore cays and great beachcombing opportunities. Fronting much of the remote half of the Crossing Place Trail, many tiny sinkholes and cave formations can be discovered in the rocky areas. Also found nearby is the interesting Blowing Hole feature, where a passage under the cliffs connects a small body of water with the ocean. This spot can be found about 600 feet (183 metres) west from the main Norbellis Coves beach. Norbellis Coves really isn’t a great place for casual swimming, but snorkelling can be good at some spots if ocean conditions are calm. Due to the distances and remoteness of this beach, be sure to bring plenty of drinking water. Stormy weather at Norbellis Coves. Large amounts of Atlantic flotsam collects on the small beaches of Norbellis Coves. Plastic fishing floats, drums, nets, rope and bottles are scattered over the area, much of which have travelled thousands of miles on the North Equatorial Current. Prized finds such as antique glass floats, some of which can still be found on remote cays, are very uncommon on the western Middle Caicos beaches due to the rocky coastlines. Along with Platico Point, it's believed that the name has Spanish origins, as Norbelis is a Cuban first name in Spanish. Unfortunately, there is no road access to Norbellis Coves. 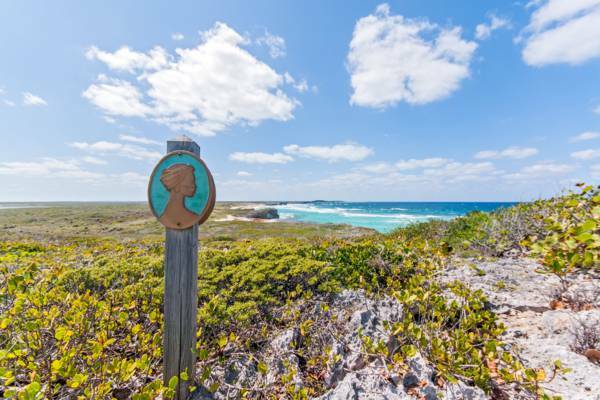 There are two ways to this beach: hiking along the clifftop Crossing Place Trail from Mudjin Harbour (about 1.5 miles), or hiking in (.5 miles) from King’s Road (the main paved road that leads into Middle Caicos from the causeway). A marker sign for the Crossing Place Trail. The easiest access to Norbellis Coves, a small trail can be found here that leads half a mile to the beach. Shoes are recommended. To find the trail head, look for the Crossing Place sign.